The Fairchild Republic A-10 Thunderbolt II is an American single-seat, twin-engine, straight-wing jet aircraft developed by Fairchild-Republic in the early 1970s. The A-10 was designed for a United States Air Force requirement to provide close air support (CAS) for ground forces by attacking tanks, armored vehicles, and other ground targets with a limited air interdiction capability. It is the first U.S. Air Force aircraft designed solely for close air support. The A-10 was designed around the GAU-8 Avenger, a heavy rotary cannon which forms the aircraft’s primary armament (and is, to date, the heaviest rotary cannon ever mounted on an aircraft). The aircraft’s hull incorporates over 1,200 pounds (540 kg) of armor and was designed with survivability as a priority, with protective measures in place which enable the aircraft to continue flying even after taking significant damage. The A-10’s official name comes from the Republic P-47 Thunderbolt of World War II, a fighter that was particularly effective at close air support. The A-10 is more commonly known by its nickname “Warthog” or simply “Hog”. As a secondary mission, it provides airborne forward air control, guiding other aircraft against ground targets. 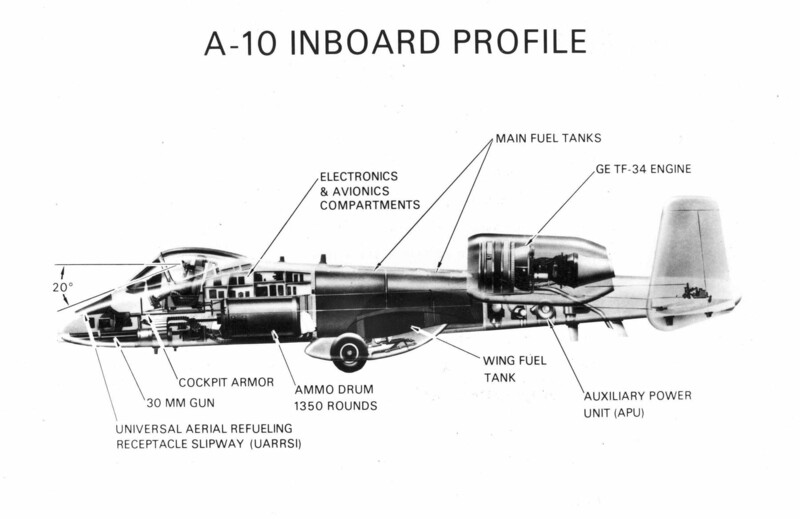 A-10s used primarily in this role are designated OA-10. The A-10 is expected to be replaced in 2028 or later. Criticism that the U.S. Air Force did not take close air support seriously prompted a few service members to seek a specialized attack aircraft. In the Vietnam War, large numbers of ground-attack aircraft were shot down by small arms, surface-to-air missiles, and low-level anti-aircraft gunfire, prompting the development of an aircraft better able to survive such weapons. In addition, the UH-1 Iroquois and AH-1 Cobra helicopters of the day, which USAF commanders had said should handle close air support, were ill-suited for use against armor, carrying only anti-personnel machine guns and unguided rockets meant for soft targets. Fast jets such as the F-100 Super Sabre, F-105 Thunderchief and F-4 Phantom II proved for the most part to be ineffective for close air support. The effective but aging A-1 Skyraider was the USAF’s primary close air support aircraft. In 1966 the U.S. Air Force formed the Attack Experimental (A-X) program office. On 6 March 1967, the Air Force released a request for information to 21 defense contractors for the A-X. The objective was to create a design study for a low-cost attack aircraft. The officer in charge of the project was Colonel Avery Kay. In 1969, the Secretary of the Air Force asked Pierre Sprey to write the detailed specifications for the proposed A-X project. However, his initial involvement was kept secret because of Sprey’s earlier controversial involvement in the F-X project. Sprey’s discussions with A-1 Skyraider pilots operating in Vietnam and analysis of the effectiveness of current aircraft used in the role indicated the ideal aircraft should have long loiter time, low-speed maneuverability, massive cannon firepower, and extreme survivability; an aircraft that had the best elements of the Ilyushin Il-2, Henschel Hs 129 and Skyraider. The specifications also demanded that each aircraft cost less than $3 million. Sprey required that the biography of World War II attack pilot Hans-Ulrich Rudel be read by people on A-X program. In May 1970, the USAF issued a modified and much more detailed request for proposals (RFP) for the aircraft. The threat of Soviet armored forces and all-weather attack operations had became more serious. Now included in the requirements was that the aircraft would be designed specifically for the 30 mm cannon. The RFP also specified an aircraft with a maximum speed of 460 mph (400 kn; 740 km/h), takeoff distance of 4,000 feet (1,200 m), external load of 16,000 pounds (7,300 kg), 285-mile (460 km) mission radius, and a unit cost of US$1.4 million. The A-X would be the first Air Force aircraft designed exclusively for close air support. During this time, a separate RFP was released for A-X’s 30 mm cannon with requirements for a high rate of fire (4,000 round/minute) and a high muzzle velocity. Six companies submitted aircraft proposals to the USAF, with Northrop and Fairchild Republic selected to build prototypes: the YA-9A and YA-10A, respectively. General Electric and Philco-Ford were selected to build and test GAU-8 cannon prototypes. The YA-10A first flew on 10 May 1972. After trials and a fly-off against the YA-9A, the Air Force announced its selection of Fairchild-Republic’s YA-10A on 18 January 1973 for production. General Electric was selected to build the GAU-8 cannon in June 1973. The YA-10 had an additional fly-off in 1974 against the Ling-Temco-Vought A-7D Corsair II, the principal Air Force attack aircraft at the time, in order to prove the need to purchase a new attack aircraft. The first production A-10 flew in October 1975, and deliveries to the Air Force commenced in March 1976. In total, 715 airplanes were produced, the last delivered in 1984. One experimental two-seat A-10 Night Adverse Weather (N/AW) version was built by converting an A-10A. The N/AW was developed by Fairchild from the first Demonstration Testing and Evaluation (DT&E) A-10 for consideration by the USAF. It included a second seat for a weapons system officer responsible for electronic countermeasures (ECM), navigation and target acquisition. The variant was canceled, and the only two-seat A-10 built now resides at Edwards Air Force Base‘s Flight Test Center Museum. The N/AW version did not interest the USAF or export customers. The two-seat trainer version was ordered by the Air Force in 1981, but funding was canceled by U.S. Congress and the jet was not produced. 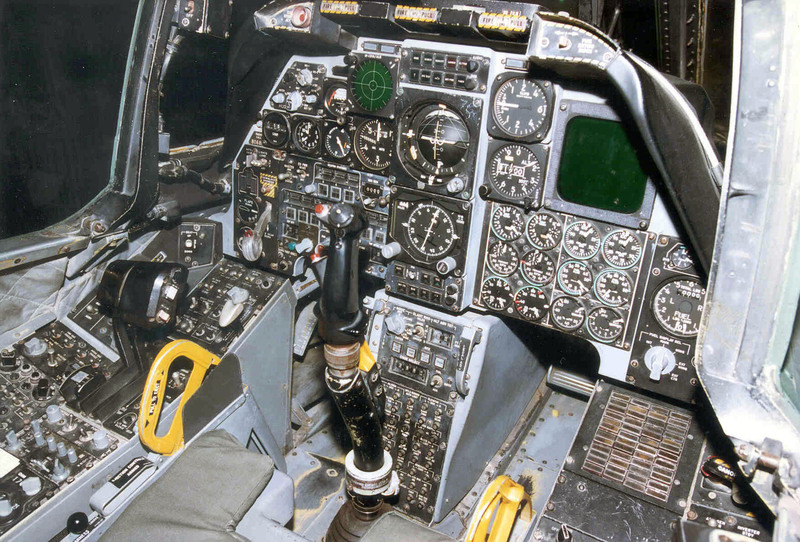 The A-10 has received many upgrades over the years. Aircraft added the Pave Penny laser receiver pod beginning in 1978. It senses reflected laser radiation from a laser designator on a target for faster and more accurate target identification. The A-10 began receiving an inertial navigation system in 1980. Later, the Low-Altitude Safety and Targeting Enhancement (LASTE) upgrade provided computerized weapon-aiming equipment, an autopilot, and a ground-collision warning system. The A-10 is now compatible with night vision goggles for low-light operation. In 1999, aircraft began to receive Global Positioning System navigation systems and a new multi-function display. Its LASTE system is being upgraded with the Integrated Flight & Fire Control Computers (IFFCC). In 2005, the entire A-10 fleet also began receiving the Precision Engagement upgrades that include an improved fire control system (FCS), electronic countermeasures (ECM), and the ability to aim smart bombs. The aircraft that receive this upgrade are redesignated A-10C. The A-10 will receive a service life extension program (SLEP) upgrade with many receiving new wings. A contract to build 242 new A-10 wing sets was awarded to Boeing in June 2007. In July 2010, the USAF issued Raytheon a contract to integrate a Helmet Mounted Integrated Targeting (HMIT) system into A-10Cs. The Government Accounting Office in 2007 estimated the cost of upgrading, refurbishing, and service life extension plans for the A-10 force to total $2.25 billion through 2013. Modifications to provide precision weapons capability are well underway. The Air Force Material Command‘s Ogden Air Logistics Center at Hill AFB, Utah completed work on its 100th A-10 precision engagement upgrade in January 2008. The C model upgrades are to be completed in 2011. The A-10 has superior maneuverability at low speeds and altitude because of its large wing area, high wing aspect ratio, and large ailerons. The high aspect ratio wing also allows for short takeoffs and landings, permitting operations from primitive forward airfields near front lines. The aircraft can loiter for extended periods and operate under 1,000 ft (300 m) ceilings with 1.5 mi (2.4 km) visibility. It typically flies at a relatively slow speed of 300 knots (350 mph; 560 km/h), which makes it a much better platform for the ground-attack role than fast fighter-bombers, which often have difficulty targeting small and slow-moving targets. Engine exhaust passes over the aircraft’s horizontal stabilizer and between the twin tails, decreasing the A-10’s infrared signature and lowering the likelihood that the aircraft can be targeted by heat-seeking missiles fired from the ground. The placement of the engines behind the wings partially shields them from anti-aircraft fire. The leading edge of the wing is honeycomb panel construction to provide strength with minimal weight compromise. Honeycomb panels of this type on the A-10 include the flap shrouds, elevators, rudders and other sections of the fins. The A-10 has integrally machined skin panels. Because the stringers are integral with the skin there are no joint or seal problems. These panels, fabricated using computer controlled machining, reduce the time and hence the cost of production. Combat experience has shown that this type of panel is more resistant to damage. The skin is not load-bearing, so damaged skin sections can be easily replaced in the field, with makeshift materials if necessary. The ailerons are at the far ends of the wings to gain greater rolling moment, as with many aircraft, but there are two distinguishing features. The ailerons are larger than is typical, almost 50% of the chord, providing improved control even at slow speeds. The aileron is also split, making it a deceleron. The Thunderbolt II can be serviced and operated from bases with limited facilities near battle areas. An unusual feature is that many of the aircraft’s parts are interchangeable between the left and right sides, including the engines, main landing gear, and vertical stabilizers. The sturdy landing gear, low-pressure tires and large, straight wings allow operation from short rough strips even with a heavy ordnance load, allowing the aircraft to operate from damaged airbases. If runways are damaged in an attack, the A-10 can operate from taxiways or straight roadway sections such as Germany’s autobahn. The aircraft is designed to be refueled, rearmed, and serviced with minimal equipment. Also, most repairs can be done in the field. The A-10 is exceptionally tough. Its strong airframe can survive direct hits from armor-piercing and high-explosive projectiles up to 23 mm. The aircraft has triple redundancy in its flight systems, with mechanical systems to back up double-redundant hydraulic systems. This permits pilots to fly and land when hydraulic power or part of a wing is lost. Flight without hydraulic power uses the manual reversion flight control system; this engages automatically for pitch and yaw control, and under pilot control (manual reversion switch) for roll control. In manual reversion mode, the A-10 is sufficiently controllable under favorable conditions to return to base and land, though control forces are much higher than normal. The aircraft is designed to fly with one engine, one tail, one elevator and half a wing torn off. Its self-sealing fuel tanks are protected by fire-retardant foam. The A-10’s main landing gear is designed so that the wheels semi-protrude from their nacelles when the gear is retracted so as to make gear-up landings (belly landing) easier to control and less damaging to the aircraft’s underside. Additionally, the landing gear are all hinged toward the rear of the aircraft, so if hydraulic power is lost the pilot can drop the gear and a combination of gravity and wind resistance will open and lock the gear in place. The cockpit and parts of the flight-control system are protected by 1,200 lb (540 kg) of titanium armor, referred to as a “bathtub”. The armor has been tested to withstand strikes from 23 mm cannon fire and some strikes from 57 mm rounds. It is made up of titanium plates with thicknesses from 0.5 to 1.5 inches (13 to 38 mm) determined by a study of likely trajectories and deflection angles. This protection comes at a cost, with the armor making up almost 6% of the aircraft’s empty weight. To protect the pilot from the fragmentation likely to be created from impact of a shell, any interior surface of the tub that is directly exposed to the pilot is covered by a multi-layer nylon spall shield. In addition, the front windscreen and canopy are resistant to small arms fire. Proof of the durability of the A-10 was shown when Captain Kim Campbell, flying a ground support mission over Baghdad during the 2003 invasion of Iraq on 7 April, suffered extensive flak damage to her A-10. Enemy fire damaged one of the A-10’s engines and crippled its hydraulic system, which required the aircraft’s stabilizer and flight controls to be operated via the back-up mechanical system, this being known as ‘manual reversion mode’. Despite this damage, Campbell managed to fly the aircraft for nearly one hour and landed safely at her air base. There are several reasons for the unusual location of the A-10’s General Electric TF34-GE-100 turbofan engines. First, the A-10 was expected to fly from forward air bases, often with substandard, semi-prepared runways that present a high risk of foreign object damage to the engines. The height of the engines decreases the chance that sand or stones will be ingested. This also allows engines to keep running while the aircraft is serviced and rearmed by ground crews, reducing turn-around time. Without the limitations imposed by engines, the wings could be mounted closer to the ground, to simplify servicing and rearming. The engines’ high 6:1 bypass ratio provides the A-10 with a relatively small infrared signature, and their position directs exhaust over the tailplanes further shielding it from detection by heat-seeking surface to air missiles. The engines are angled upward by nine degrees to cancel out the nose-down pitching moment they would otherwise generate due to being mounted above the aerodynamic center of the aircraft. This avoids the necessity to trim the control surfaces against the force. The heavy engines require strong supports, so their pylons are connected to the airframe by four bolts. The A-10’s fuel system components are protected in multiple ways. All four fuel tanks are located near the center of the aircraft, reducing the likelihood that they will be hit or have their fuel lines severed. The tanks are separate from the fuselage; thus, projectiles would need to penetrate the aircraft’s skin before reaching the outer skin of the tank. The refueling system is purged after use so that all fuel in the aircraft is protected from fire. All fuel transfer lines self-seal if they are compromised. Most of the fuel system components are inside the tanks so that fuel will not be lost in case a component were to leak. If a tank is damaged beyond its ability to self-seal, check valves ensure that fuel does not flow into the compromised tank. Most importantly, reticulated polyurethane foam lines both the inner and outer sides of the fuel tanks, retaining debris and restricting fuel spillage in the event of damage. The other source of possible combustion, the engines, are shielded from the fuel system and the rest of the airframe by firewalls and fire extinguishing equipment. Even in the event of all four main tanks being penetrated and all contents lost, sufficient fuel is carried in two self-sealing sump tanks to allow flight for 230 miles (370 km). Although the A-10 can carry considerable disposable stores, its primary built-in weapon is the 30 mm GAU-8/A Avenger Gatling-type cannon. One of the most powerful aircraft cannons ever flown, it fires large depleted uranium armor-piercing shells. In the original design, the pilot could switch between two rates of fire: 2,100 or 4,200 rounds per minute; this was changed to a fixed rate of 3,900 rounds per minute. The cannon takes about half a second to come up to speed, so 50 rounds are fired during the first second, 65 or 70 rounds per second thereafter. The gun is precise; it can place 80% of its shots within a 40-foot (12.4 m) circle from 4,000 feet (1,220 m) while in flight. 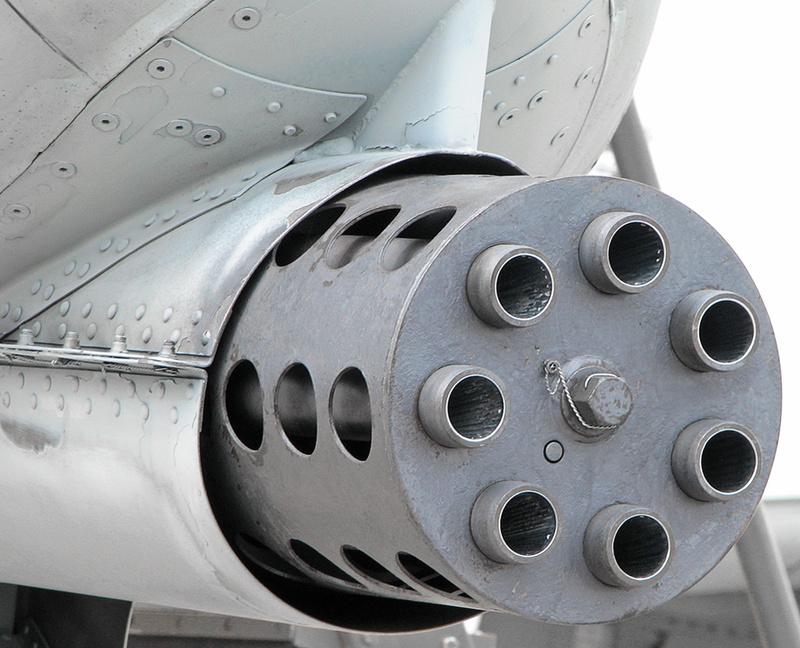 The GAU-8 is optimized for a slant range of 4,000 feet (1,220 m) with the A-10 in a 30 degree dive. The fuselage of the aircraft is built around the gun. The gun’s firing barrel is placed at the 9 o’clock position so it is aligned on the aircraft’s centerline. The gun’s ammunition drum can hold up to 1,350 rounds of 30 mm ammunition, but generally holds 1,174 rounds. The damage caused by rounds firing prematurely from impact of an explosive shell would be catastrophic, so a great deal of effort has been taken to protect the 5 feet 11.5 inch (1.816 m) long drum. There are many armor plates of differing thicknesses between the aircraft skin and the drum, to detonate an incoming shell before it reaches the drum. A final layer of armor around the drum protects it from fragmentation damage. The gun is loaded by Syn-Tech’s linked tube carrier GFU-7/E 30 mm ammunition loading assembly cart. Another commonly used weapon is the AGM-65 Maverick air-to-surface missile, with different variations for either electro-optical (TV-guided) or infrared targeting. The Maverick allows targets to be engaged at much greater ranges than the cannon, a safer proposition in the face of modern anti-aircraft systems. During Desert Storm, in the absence of dedicated forward-looking infrared (FLIR) cameras for night vision, the Maverick’s infrared camera was used for night missions as a “poor man’s FLIR”. Other weapons include cluster bombs and Hydra rocket pods. 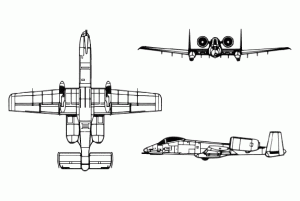 Although the A-10 is equipped to carry laser-guided bombs, their use is relatively uncommon. 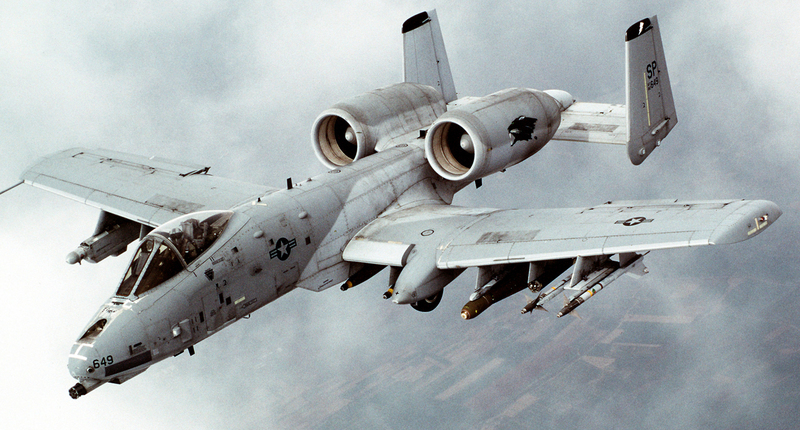 The A-10 has not been equipped with weapon control systems for accurate bombing as of 2000. A-10s usually fly with an ALQ-131 ECM pod under one wing and two AIM-9 Sidewinder air-to-air missiles under the other wing for self-defense. Other funded improvements to the A-10 fleet include a new data link, the ability to employ smart weapons such as the Joint Direct Attack Munition (“JDAM”) and Wind Corrected Munitions Dispensor, and the ability to carry an integrated targeting pod such as the Northrop Grumman LITENING targeting pod or the Lockheed Martin Sniper XR Advanced Targeting Pod (ATP). Also included is the ROVER or remotely operated video enhanced receiver to provide sensor data to personnel on the ground. 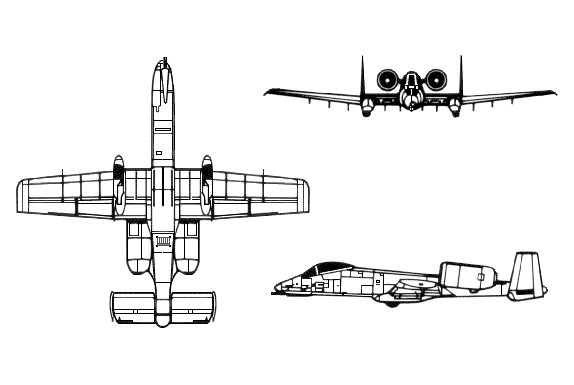 The two most common markings applied to the A-10 have been the European I woodland camouflage scheme and a two-tone gray scheme. The European woodland scheme was designed to minimize visibility from above, as the threat from hostile fighter aircraft was felt to outweigh that from ground-fire. It uses dark green, medium green and dark gray in order to blend in with the typical European forest terrain and was used from the 1980s to the early 1990s. Following the end of the Cold War, and based on experience during the 1991 Gulf War, the air-to-air threat was no longer seen to be as important as that from ground fire, and a new color scheme known as “Compass Ghost” was chosen to minimize visibility from below. This two-tone gray scheme has darker gray color on top, with the lighter gray on the underside of the aircraft, and started to be applied from the early 1990s. Many A-10s also featured a false canopy painted in dark gray on the underside of the aircraft, just behind the gun. This form of automimicry is an attempt to confuse the enemy as to aircraft attitude and maneuver direction. The A-10 was used in combat for the first time during the Gulf War in 1991, destroying more than 900 Iraqi tanks, 2,000 military vehicles, and 1,200 artillery pieces. A-10s shot down two Iraqi helicopters with the GAU-8 cannon. The first of these was an Iraqi helicopter shot down by Captain Robert Swain over Kuwait on 6 February 1991, marking the A-10’s first air-to-air victory. Four A-10s were shot down during the war, all by surface-to-air missiles. Another three battle-damaged A-10s and OA-10As returned to base but were written off, some sustaining additional damage in crashed landings. The A-10 had a mission capable rate of 95.7%, flew 8,100 sorties, and launched 90% of the AGM-65 Maverick missiles fired in the conflict. Shortly after the Gulf War, the Air Force gave up on the idea of replacing the A-10 with a close air support version of the F-16. 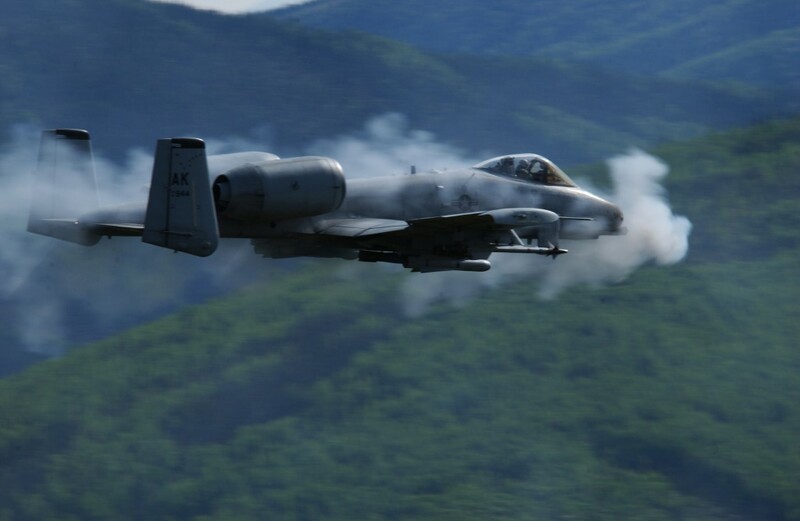 U.S. Air Force A-10 Thunderbolt II aircraft fired approximately 10,000 30 mm rounds in Bosnia and Herzegovina in 1994–1995. Following the seizure of some heavy weapons by Bosnian Serbs from a warehouse in Ilidža, a series of sorties were launched to locate and destroy the captured equipment. On 5 August 1994, two A-10s located and strafed an anti-tank vehicle. Afterwards, the Serbs agreed to return remaining heavy weapons. In August 1995, NATO launched an offensive called Operation Deliberate Force. A-10s flew close air support missions, attacking Serbian artillery and positions. In late September A-10s began flying patrols again. Operation Iraqi Freedom began on 20 March 2003. Sixty OA-10/A-10 aircraft took part in early combat there. United States Air Forces Central issued Operation Iraqi Freedom: By the Numbers, a declassified report about the aerial campaign in the conflict on 30 April 2003. During that initial invasion of Iraq, A-10s had a mission capable rate of 85% in the war and fired 311,597 rounds of 30 mm ammunition. A single A-10 was shot down near Baghdad International Airport by Iraqi fire late in the campaign. The A-10 also flew 32 missions in which the aircraft dropped propaganda leaflets over Iraq. The A-10C first deployed to Iraq in the third quarter of 2007 with the 104th Fighter Squadron of the Maryland Air National Guard. The jets include the Precision Engagement Upgrade. The A-10C’s digital avionics and communications systems have greatly reduced the time to acquire a close air support target and attack it. On 25 March 2010, an A-10 conducted the first flight of an aircraft with all engines powered by a biofuel blend. The flight, performed at Eglin Air Force Base, used a 1:1 blend of JP-8 and Camelina-based fuel. The A-10 is scheduled to be in service with the USAF until 2028 and possibly later, when it may be replaced by the F-35 Lightning II. Critics have responded by saying that replacing the A-10 with the F-35 would be a “giant leap backwards” given the performance of the Warthog and the rising costs of the F-35 program.